Built in GPS Navigation systems are now very common on newer vehicles, especially the well equipped models. If you are tired of using that small, theft-prone GPS Navigation that hangs from your windshield it may be time to upgrade to an in-dash system. Benefits include a bigger monitor/screen, voice guidance through your car's speakers, and you will never have to hide it like the portable units or find a place to plug it in. You will get a factory-like appearance with our installation. There are many solutions for most vehicles. Backup Cameras are now very popular on many newer vehicles. In fact, US federal regulations state that all 2016 and up model year passenger vehicles sold in the US must be equipped with a factory backup camera. Backup cameras make driving and parking a little easier and safer. Have you ever gotten out of your vehicle while backing up to see just how close you are vehicle or object behind you? That will never happen again. Master parking your vehicle and eliminate that blind spot that a child could be in. Do you already have a backup camera and and want more visibility while turning or changing lanes? Blindspot cameras are mounted on the driver and passenger sides of vehicle and automatically allow you to view the area that your side mirrors don't see. Use your blinkers to view the blindspot. Back your vehicle up safely with a Backup Sensor System. Backup Sensors come standard on some vehicles. Sensors are mounted flush in the rear bumper and an in-car buzzer gives the driver a series of beeps while backing up. The faster the beeps, the closer you are to an object behind you. Some systems come with an optional dash mounted display. They are very easy to use and can be used with or without a backup camera. It's a law in most states, including Connecticut, that handheld cell phone use is illegal. There are hefty fines if you're caught. Don't take that chance and drive safe using an installed bluetooth handsfree system. There are many different solutions depending on your your application. Most systems have an installed microphone. The sound comes through your existing car speakers, giving a much better experience and helping you stay productive during those long commutes. Stay warm this winter with a remote car starter! Start you vehicle and and warm it up from the comfort of your home or work. Systems work from 1000ft, up to 3000ft, to around the world using your cell phone. Add an alarm/security system to help protect valuables in your car. Long Mobile LLC uses Compustar Prime, Drone and iDatalink exclusively, providing you a top grade product and years of trouble free use. Let us set you up with a system that's right for you. Keep those kids quiet and entertained with a DVD entertainment system. You'll never hear that "Are we there yet?" coming from your back seat again. 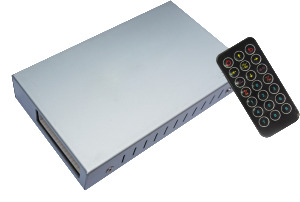 Add an auxiliary input and power inverter to play your kids favorite video game system. There are a variety of systems available and can be tailored to your needs. Front mounted camera/DVR systems are becoming more popular these days. With all of the congestion on the roads accidents happen. Record the road ahead of you to be able to show police how the accident occurred, or if you are so inclined, you may be able to help someone else even if you're not directly involved. Some systems even include a crash avoidance alerts to help avoid potential accidents. Commercial grade systems include a rear facing interior camera that's great for buses and vans carrying adults and children. Inquire about what system is best for you.